Last weekend, I visited Utrecht again. 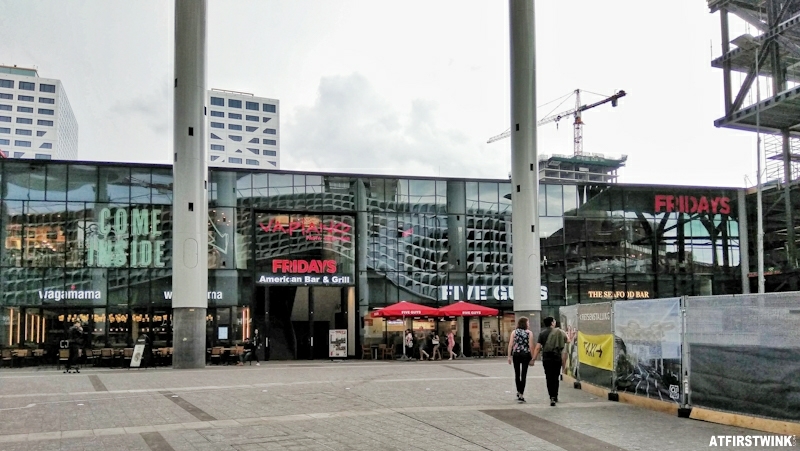 About my previous visit, I have written something about the Hoog Catharijne shopping mall and the Five Guys burger restaurant. I still got some questions about where the Five Guys burger restaurant is located, so I will explain it more thorough in this blog post. In the picture underneath, you can see the Utrecht Central Station, Hoog Catharijne exit. 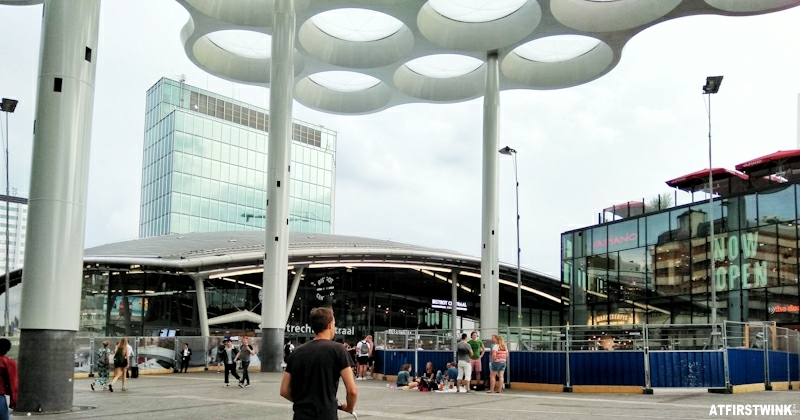 How you know if you have chosen the right exit, out of the two main exits of the Utrecht Central Station? 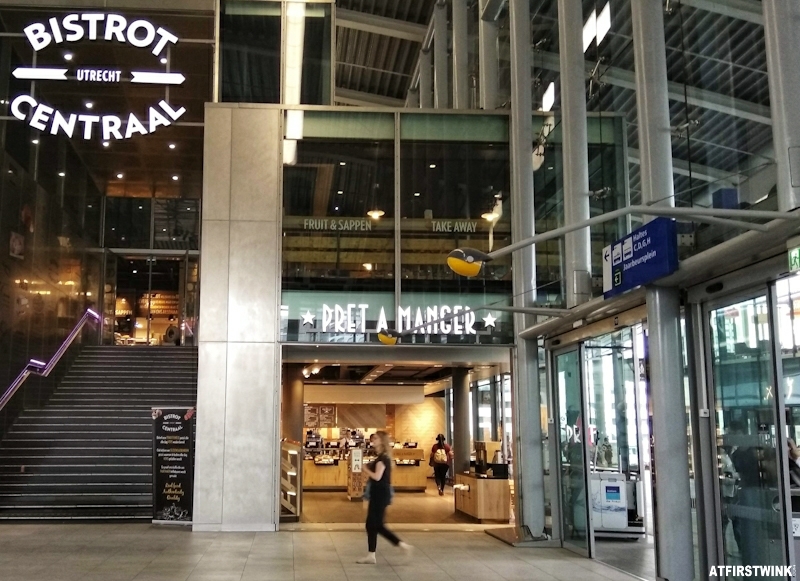 After you have left the gates, you should see the stairs leading to the Bistrot Utrecht Centraal restaurant and the Pret A Manger shop on the left. After you exit from the automatic glass doors in the picture above, you should see the glass building, called the Paviljoen, on your left. The glass building houses many famous and interesting eateries: Vapiano (Italian food), Wagamama (Asian food), Exki (healthy food), Illy caffè (cafe), Manneken Pis (Belgian fries), TGI Fridays (American bar and grill restaurant), The Seafood bar (seafood), Five Guys (burger restaurant), and The döner company (döner kebab restaurant). 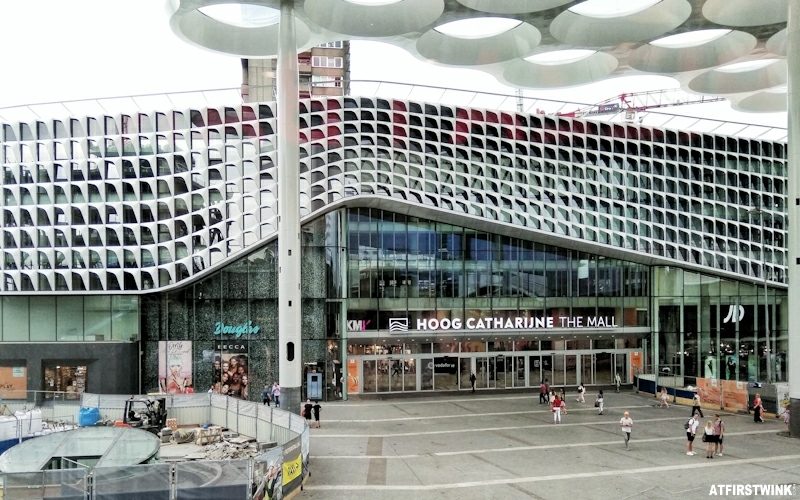 On your right, you will see the Hoog Catharijne shopping mall. 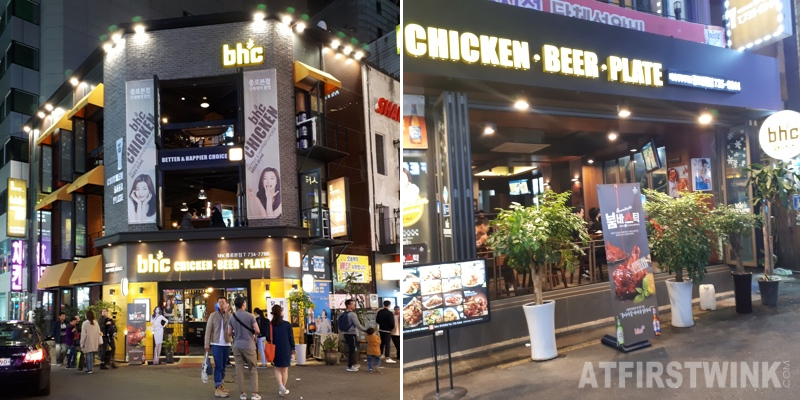 Since my previous visit, the wooden boards around the entrance had been removed and many new shops have opened. On the left in the picture, you can find the entrance to Boots (pharmacy with longer opening hours than normal pharmacies and health and beauty store) and the shop window of a large Douglas store (beauty and cosmetics store). 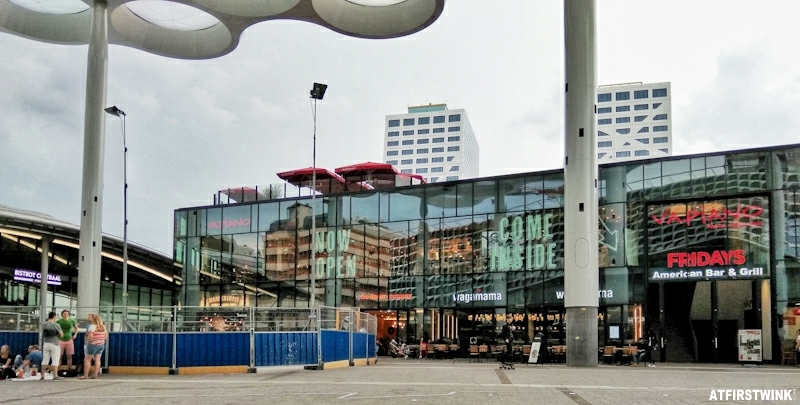 Right behind the Boots store, you can find the first Normal store in the Netherlands. On the right in the picture, you can see the JD store (sports store, 369 m²). Together with the HKMX by Hunkemöller Sportswear store (female sport store, 1st in the Netherlands, 80 m²) nearby, The Athlete´s Foot store (sports store, 160 m²), Perry Sport store (sport store with an experience box for events, workshops, trainings, and try-outs, a customable print service for clothing, and 3D foot scan for the perfect sports shoe) and Nike store (over 1000 m², special services such as running analysis for the perfect shoes and sports bra fitting), there is always something for the sports fanatic. Near the Stadskamer, you can also find the first Baskin robbins ice cream shop in the Netherlands. Soon to be opened: Casa (home interior and accessories shop, first in the Netherlands!) on 1 June and Pieces (fashion and accessories store, 25% on everything in the long opening weekend from 7-10 June) on 7 June. Søstrene grene store: new pink velour chair! #metoo ... And then what?